Last Sunday, the fifth sangha gathering was held in Freiburg, Germany, and it was the largest gathering so far, with almost 20 attendees! 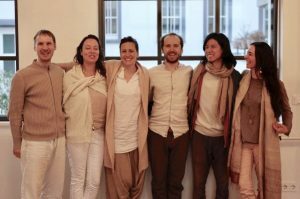 On the same day, the Belgian sangha came together in Flanders – in growing numbers as well. The fruits of Igor’s ongoing activity and work during his 3-year stay in Europe, where many live programs with him were offered, become visible and are now being tasted in all their nourishing sweetness. 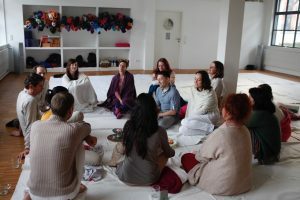 Many sincere newcomers — initiated into meditation and this unique path by Igor during the ‘Entering the Heart’ immersion only two weeks ago — were warmly welcomed in both countries. In Freiburg, some of Igor’s long-time students and dedicated team members were able to join, and the gathering unexpectedly turned into an international one — with participants from the United States, Poland and Switzerland. Among the participants was a mother-to-be in an advanced state of pregnancy, as well as a new mother, whose sweet baby had been with us – yet unborn – during two events with Igor last year. It is also worth mentioning that one young woman got up at 4:30 a.m. to travel through half of Germany in order to join the gathering for the first time! What a blessing it is that this budding community exists in these two cities in Europe! 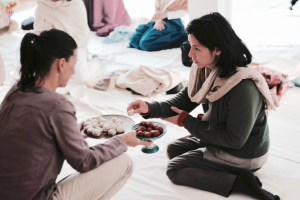 These sangha gatherings provide a safe container for giving ourselves to this inner work together, for continuing our spiritual practice and nurturing the seed of grace in our hearts. Though still in their tender stages, the depth, power and potential of this vibrant field is already felt by us all when we get together with these pure intentions. During the time of rest which always follows our sittings, bodies often vibrate in palpable bliss, while the mind more easily tunes in to the silent song of the heart. 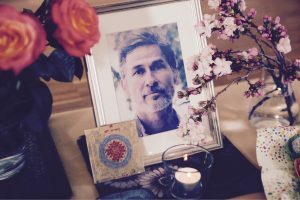 A regular feature of our monthly gatherings, is the screening of a recorded darshan or Q&A session with Igor from one of his immersions. 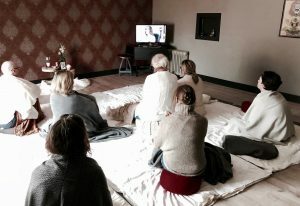 For this last gathering in Freiburg, we decided to watch the video “How to Survive Surrender” together, a discourse in which Igor addresses common fears of losing stability and control, experienced by many who undergo the journey of awakening. 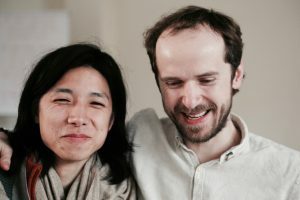 Many of our new sangha members have been encountering these fears in the past weeks and months, and found relief in now discovering that this stage is not only known and experienced by many others, but is an inevitable and necessary part of this demanding process of genuine transformation. Inspiring conversation followed, in a spontaneous circle where many opened up to share vulnerability, insights and experiences related to this theme. In Flanders, the group watched the video “Working with Light”, Igor’s response to a question during one of his live webinars; it is a relevant and timely reminder about expanding the light of our awareness, which inevitably dissolves perceived shadows in our psyche, allowing them to fade back into the fabric of Consciousness Itself.